After reinvigorating both the skateboard and the endless runner genres with their OlliOlli series, Roll7 have returned with a whole new type of game that combines their usual 2D retro-cool style with a slick assassin plot. 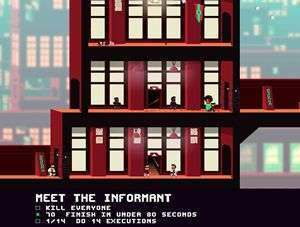 Not A Hero has you playing as an assassin, initially a Danny Dyer style cockney stereotype, who takes on the jobs his boss, Bunnylord, can’t do. That’s because Bunnylord is running for mayor and his approval rating is directly tied to how well you can take on the game’s twenty one levels. Each level gives you a main objective and three sub-objectives (usually tied to time limits, ammo conservation or finding collectibles) and sends you out into level full of 2D floors packed with enemy goons. Think Elevator Action if it was created by John Woo. The side-on 2D action has a Metroidvania feel, however, you can’t really jump, unless it’s out of a window (sort of, you don’t really jump but you still find yourself flying through them at an alarmingly regular rate). Instead, you run around shooting the opposition, occasionally knocking them down by sliding into them and then executing them at close range. There are plenty of enemies waiting for you, though, and these will react to noise and come and get you, following you around the level if they have to. Combat is settled mostly by way of the gun. You can shoot enemies and duck into cover whenever you need, but you have to time it right – it’s very easy to get it wrong and end up with a bullet sandwich right in your stupid gob. When it works though, you’ll be flowing around like a murderous Billy Elliott and it’s all pretty satisfying. As you complete the various tasks set for you, Bunnylord gains new assassins for you to play with. Each of these has a different weapon, physical abilities and character. While many of these will appear less than useful at first, you’re sure to find a favourite or even just ones that are temporarily better for the stage you are about to take on. That said, most of them seem to be a fair bit worse than the chap you start with. The good news is that Not A Level works. It’s stylish, sassy and satisfying. The difficulty curve isn’t nearly as crushing as it was on OlliOlli too, although the game definitely puts up a fight the further you get through it. There isn’t much variation on offer, though. The twenty one levels are split between three districts, so each third of the game will look pretty samey and the gameplay doesn’t really evolve as you go along. Some sections are set up in such a way that you’ll need to use your brain to figure out how to get it done efficiently but beyond that, this is just a game about shooting people. Despite the different developer, this game most reminds me of Hotline Miami. Like that game it shared a similar aesthetic with the same style of graphics and music and while it was a top-down title, it felt similar to this in so far as the margin for success sometimes feeling like a mix between skill and luck. When things are going well, it’s all very nice and enjoyable, but when you’re ten minutes into a perfectly run level and the game throws in a heap of enemies from nowhere, it can all feel a bit cheap. Likewise, sometimes an enemy dies when you shoot him and sometimes you come off worse. The difference can come down to fractions of a second. If you’re bored to tears of the current retro revival, this isn’t going to win you over but it’s easy to like Not A Hero. 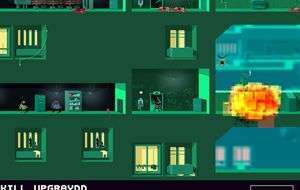 It’s not got the wow factor of OlliOlli, perhaps because we’ve all seen a million run-and-gun games by now, but the game offers a fun, and funny, trip into the world of political assassinations for those who don’t mind a challenge. Running and gunning has never been as stylish and Not A Hero will challenge your trigger finger and your brain but there's not a whole lot of content on offer here and as the difficulty ramps up, a little of the fun is lost. But, overall, Not A Hero is well worth a look. Great review Richie baby! I was kind of tempted to pick this up, but I think I might steer clear. I didn’t love Hotline Miami so if there is echoes of that then this may not be for me. Plus there are like a million games that I want at the moment, so Bunnylord might be out of luck.